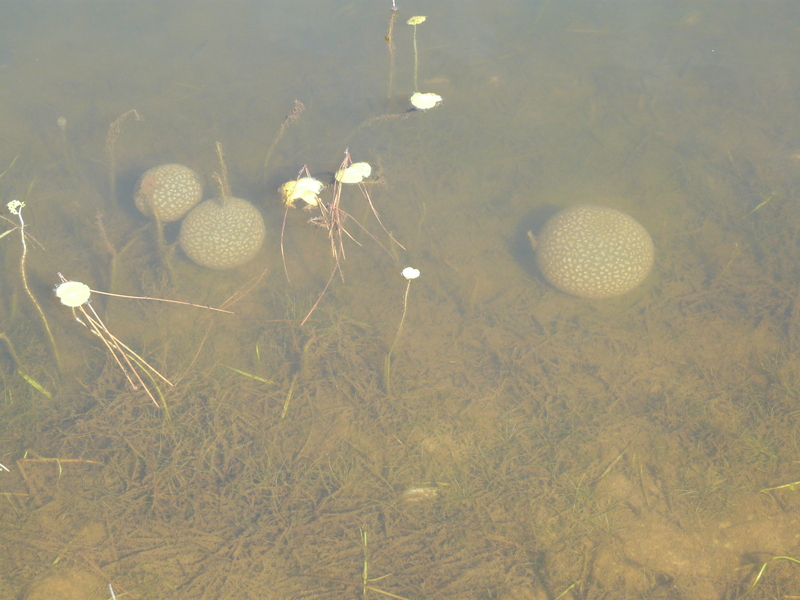 We were looking at some pond weeds this week and saw an Unidentified “Floating” Object. Well, it wasn’t exactly floating. But it looked like Jell-O sitting on the bottom. We picked it up and set it on the ground. It’s texture was like a jellyfish. We cut it into also. They may indicate that the bream population of this pond is not very abundant. Ask about fishing success and if bream are caught. Sometimes, in a bass overcrowded pond, the bream population is so low that these invertebrates can thrive. You may have seen these before. This is one of those, ‘you learn something knew everyday.’ The Smithsonian Marine Station has more information. We are getting closer to water temperatures being 70 degrees which is when we start treating for pond weeds. We had a huge turnout at this year’s pond meeting in which UGA Aquatic Specialist Dr. Burtle provided us an update on fertilizing, liming, and treating weeds. 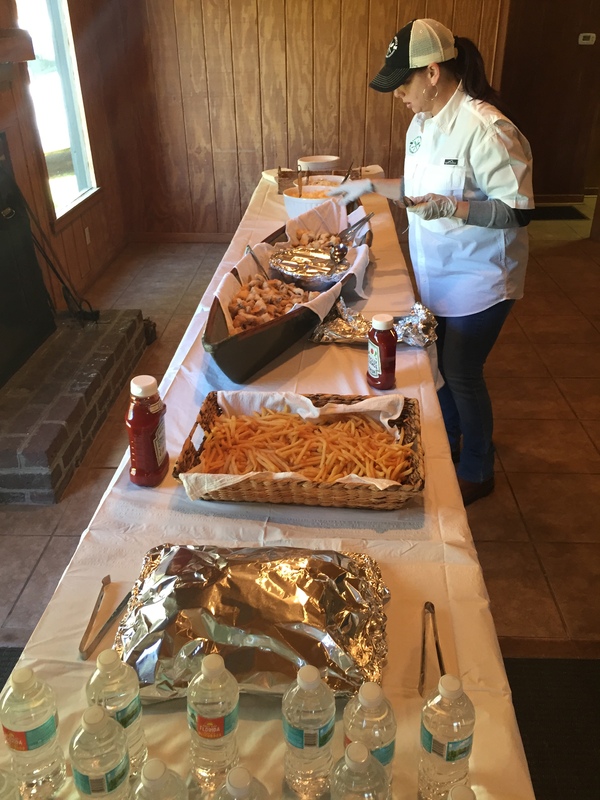 A big thanks to Alan Dennard and Ken McKinnis sponsoring the meal for us as well. Last week, I looked at my first pond of the season. This pond is completely covered with naiad, which is a submerged weed. There is not much algae and some alligator weed. We have to get weed control started soon before it becomes impossible. Diquat is commonly used for submerged weeds and is a contact herbicide. 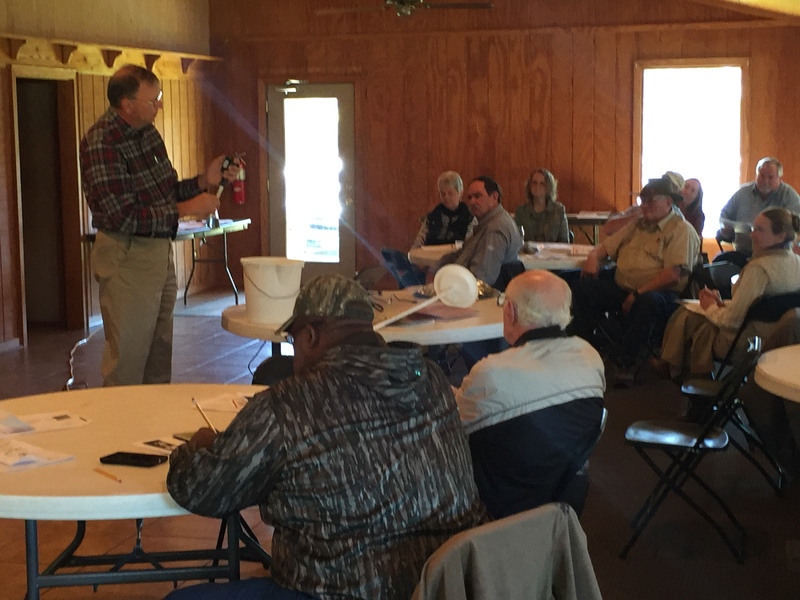 Dr. Burtle talked about different herbicides and how they behave different in the water. Sonar, which is more expensive, provides longer weed control since it stays active through the year. So there are benefits to using different compounds. In either case, we have to ID the weed and select the correct herbicide for control. 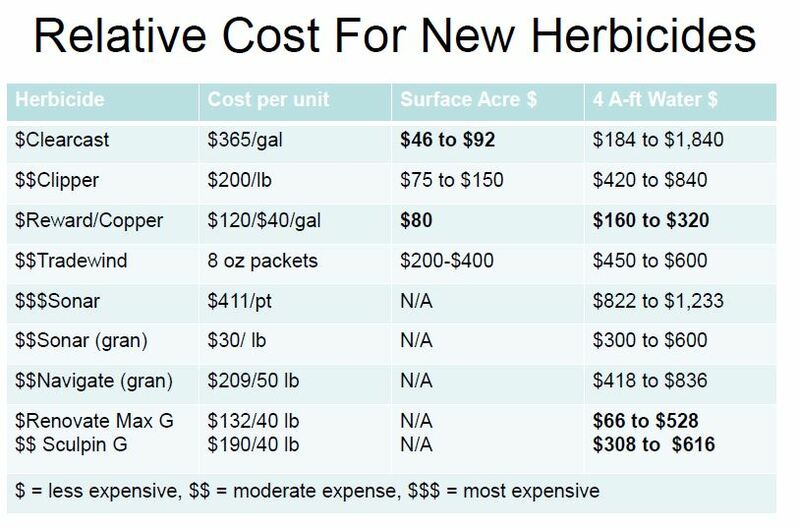 Here is a slide Dr. Burtle shared of relative cost of aquatic herbicides that may be helpful as we begin our season. Allen and Andrea Poppell cooked a great catfish dinner. Loved seeing the fish in the boat. 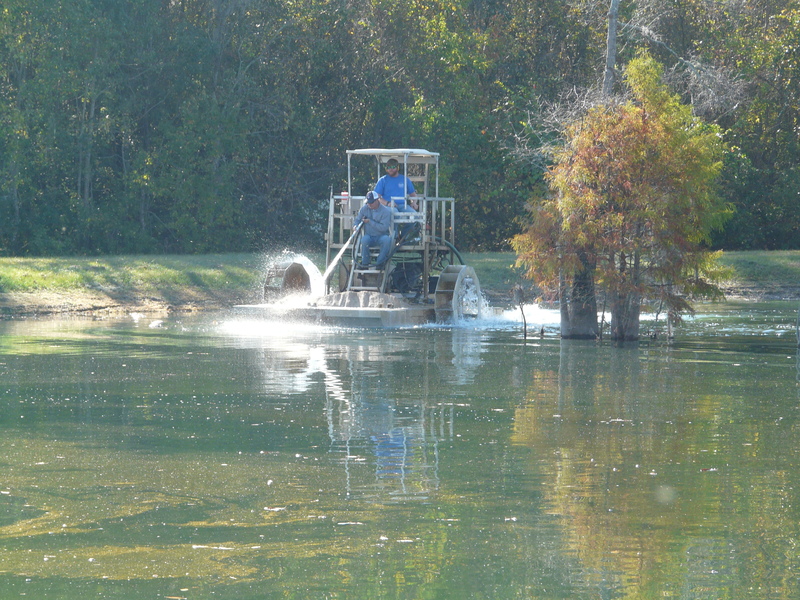 We talk about weed issues in ponds, but another aspect of pond management is fertilization and liming. 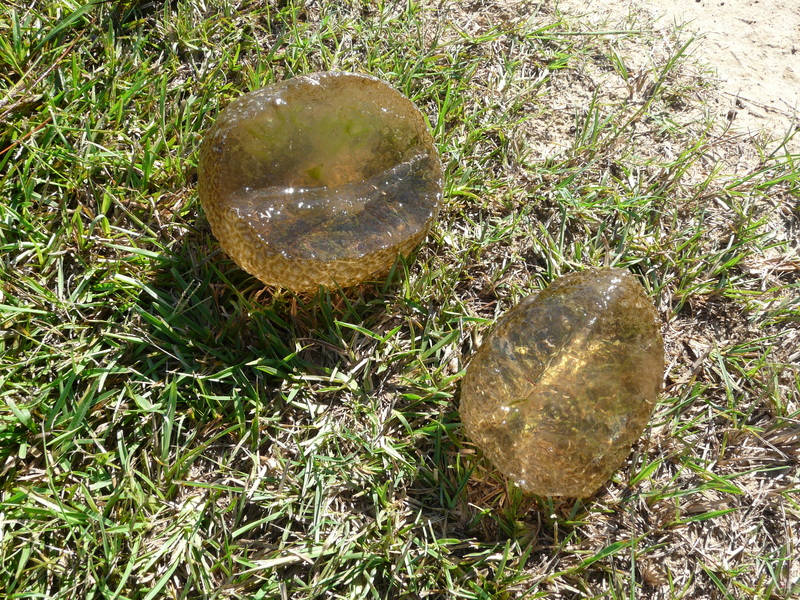 Haphazard fertilization programs are not recommended in ponds. However, liming every few years has cultural benefits to a pond and keeps the water alkalinity above 50 parts per million (ppm) which is better for certain herbicides. 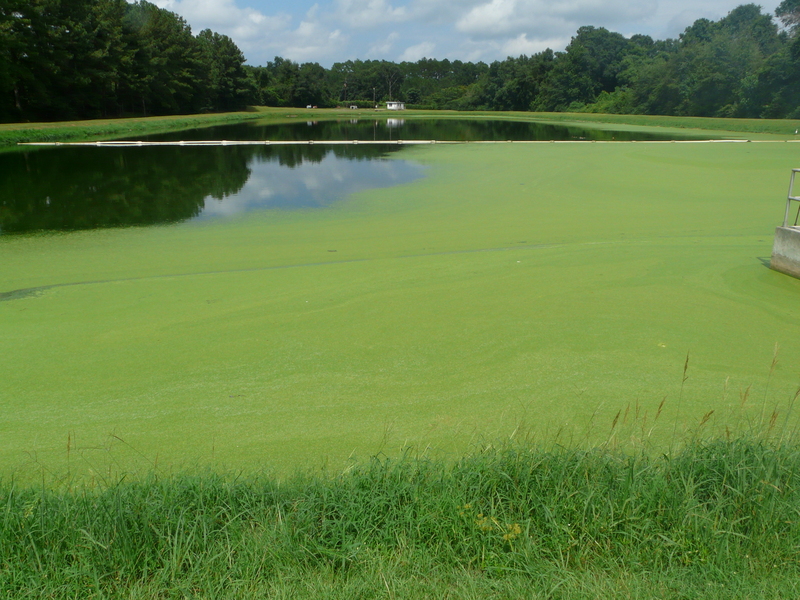 When the soils become more acid, important pond nutrients like phosphorus (P) is not available to algal production. Phytoplankton are important for fish ponds for the production of oxygen. They also convert nutrients like ammonia, which can be toxic to fish, into a non-toxic form. We spend a lot of time looking at pond weeds during the summer. When we have filamentous algae, we use compounds with copper. Copper that is toxic to plants and parasites in pond water is also toxic to catfish when the water is very soft. Copper sulfate is an example of these herbicides that is more likely to cause fish toxicity. Alkalinity needs to remain above 50ppm. If there is no water in the pond, you can do a routine pH test on the soil. But it is not recommended to do a pH test of the water, because pH in water changes during the day. It is better to calculate the hardness of the water. 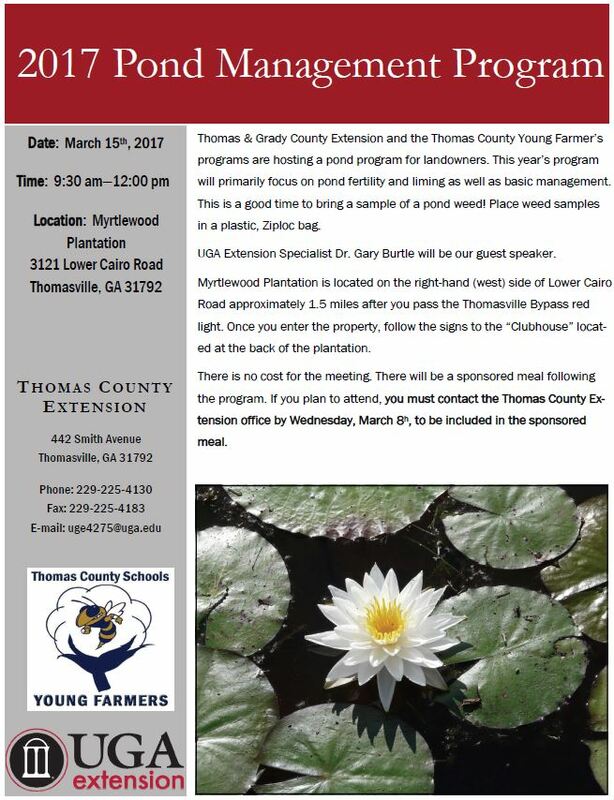 UGA Extension Aquatic Specialist Dr. Gary Burtle has worked with the UGA Water lab in developing a pond water test. In my experience, if the pond has not been limed in a few years, it’s going to need lime. I’ve never seen a test come back that said no lime needed. The real issue is solubility and particle size. Dr. Burtle says most of the lime should pass through a screen size of 200 meshes per inch. Lime larger than 60 mesh is too large; it dissolves too slow. Hydrated lime is a good lime for ponds, because it is more soluble in water than calcium carbonate. Lime that passes through a 200 mesh, such as hydrated lime, is recommended for ponds. If no water is in the pond, agriculture lime can be applied on dry pond bottom. Soil test of pH can determine the need. With water, the worst thing we can do is dump lime in the pond from the edge. It is also not recommended to lime the perimeter of the pond. You need a boat to do it properly. Specialized equipment is also needed to calibrate correctly. 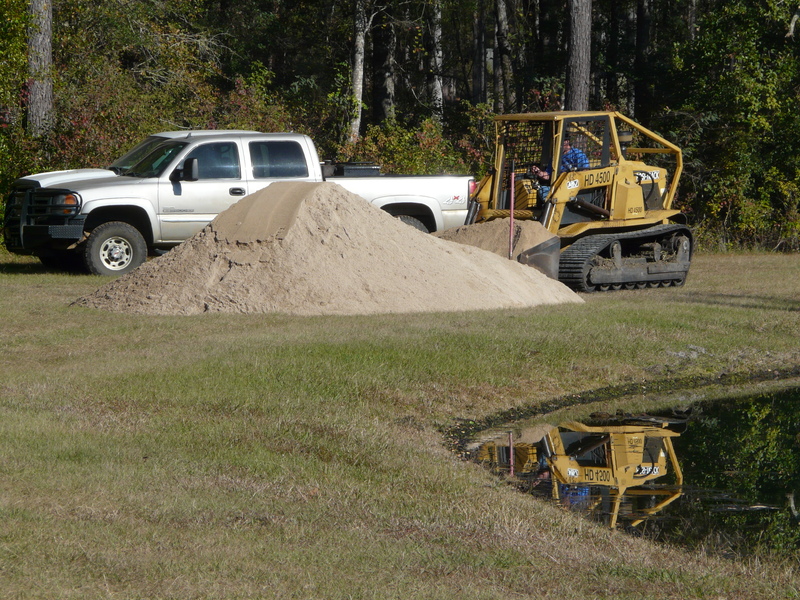 Here In the top photo is Alan Dennard and Ken McKinis liming a pond a few weeks ago. They would make several passes over to not create hot spots. I was talking with Alan Dennard who treats ponds in our area, and like myself, he claimed this season has been lowest calls for pond weeds in a while. We’ve had much fewer pond calls this year for some reason. But lately, I’ve been catching up. 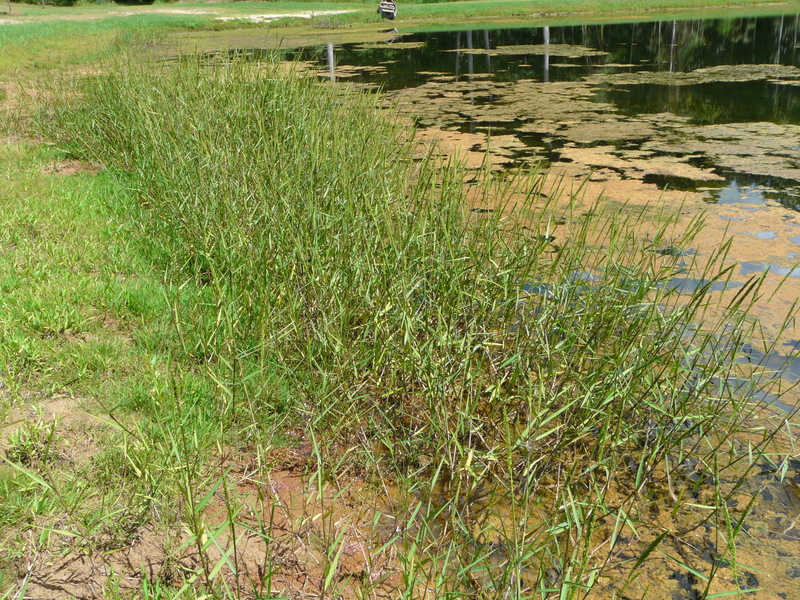 The good news is that we are moving back into a period better for treatment of pond weeds. If you treat on your own during the summer, we have to be careful not to cause an oxygen depletion which would kill fish. Treating 1/4 to 1/3 of the weed infestation at a time is recommended. This week, I looked at a grass I had not seen before. 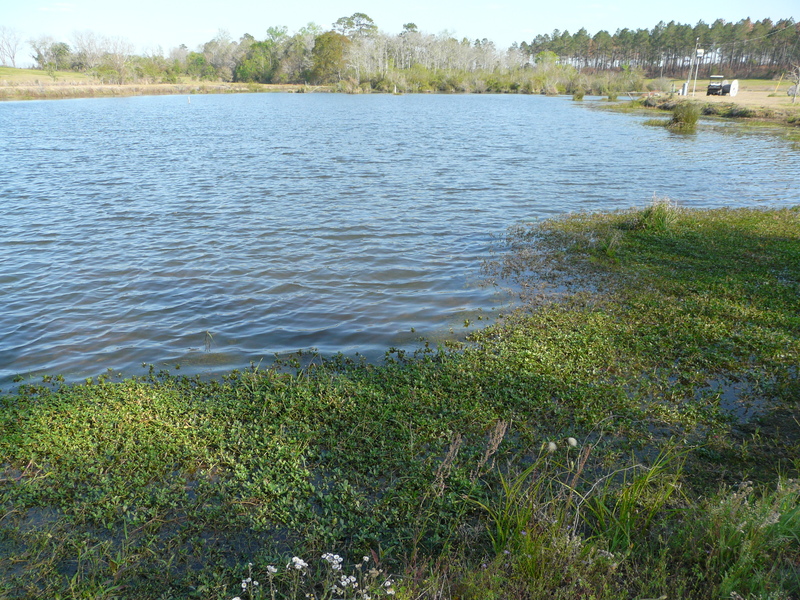 It turned out to be baggy knee grass, one UGA Aquatic Specialist Dr. Gary Burtle says is showing up more and more in South GA ponds. The flower is easy to ID. To the left is a picture of that. The good news is glyphosate has activity on this weed. 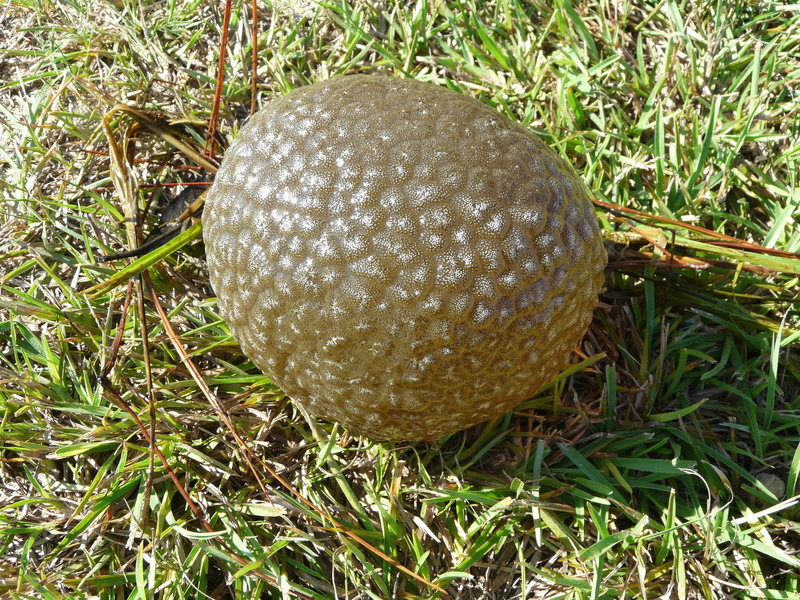 We pretty much start with this active ingredient for grasses nonetheless. A 2% solution spot spray with a surfactant is the recommended rate. Behind you’ll also notice filamentous algae. There was also a submersed weed I could not see to identify. We’d have to use copper complex herbicides for algae and diquat for underwater weeds. With temperatures in the upper 80s and low 90s, we still have to take precaution in treating that algae and submersed weeds. Most filamentous algae control methods are similar, except for a few species. And these are one of them. 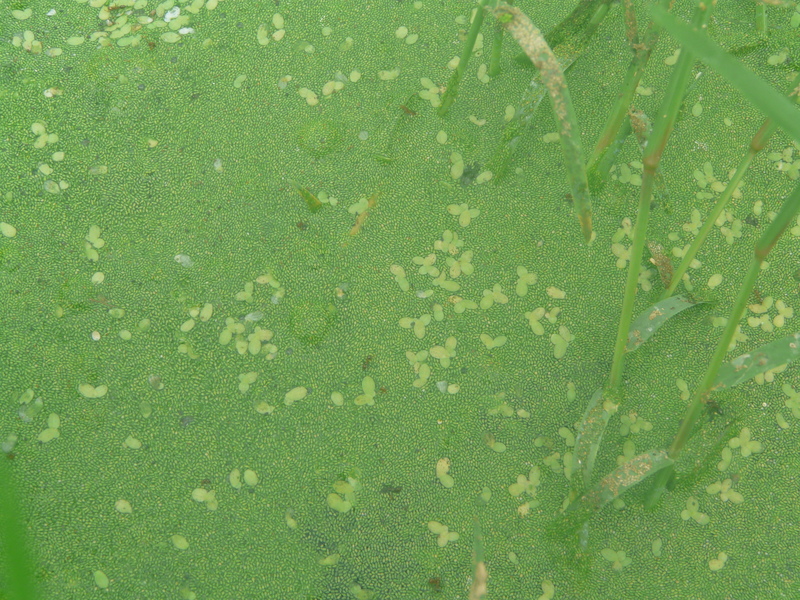 This is a group of wide-spread algae that are difficult to control. Pithophora and Rhizoclonium are in the filamentous algae category. They resemble a mass of wet-green wool. 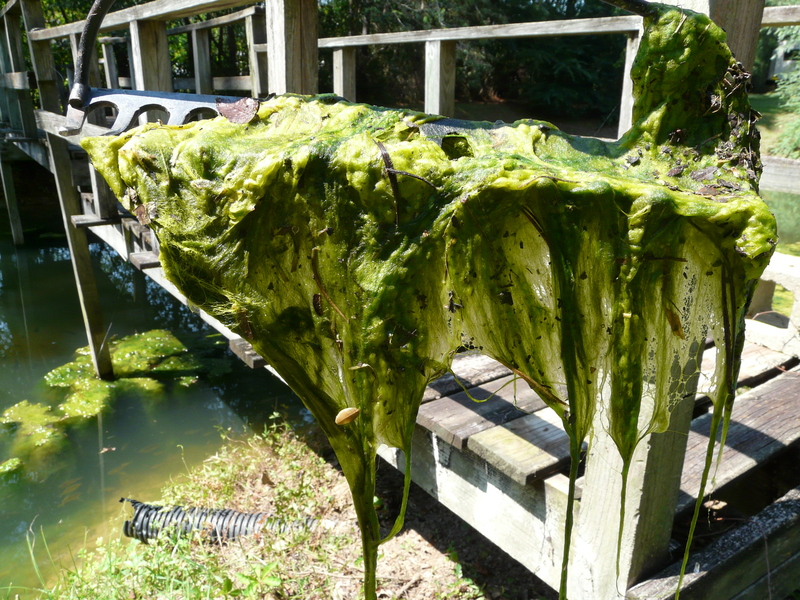 Control with these types of algae is more complicated than other species. If you ever see an algae that feels like wool when you pull it from the water, it one of these species. Pithophora may be more common. This is the first time I’ve seen Rhizoclonium. The only difference between the two is microscopic. In the water, we still need to pull samples to determine if it’s pithiphora or rhizoclonium. Essentially, we can treat these “wool-like algae” the same. Use a tank mix of cutrine plus with diquat at ½ gallon each per surface cre. This pond is very, very small – probably 1/10 of an acre, if that. Weedtrine D is another choice for small ponds. It is a dilute formula of diquat that is about 1/10 the concentration of Reward or generic Diquat which are 2.0 pounds AI per gallon. Could we use copper sulfate instead of Cutrine Plus? Yes. This difference is that Copper sulfate is more toxic to fish in soft water. UGA Aquatic Scientist Dr. Gary Burtle says copper sulfate is okay as long as the crystals are dissolved. Add about an ounce of copper sulfate per gallon of water, and get most of it dissolved. 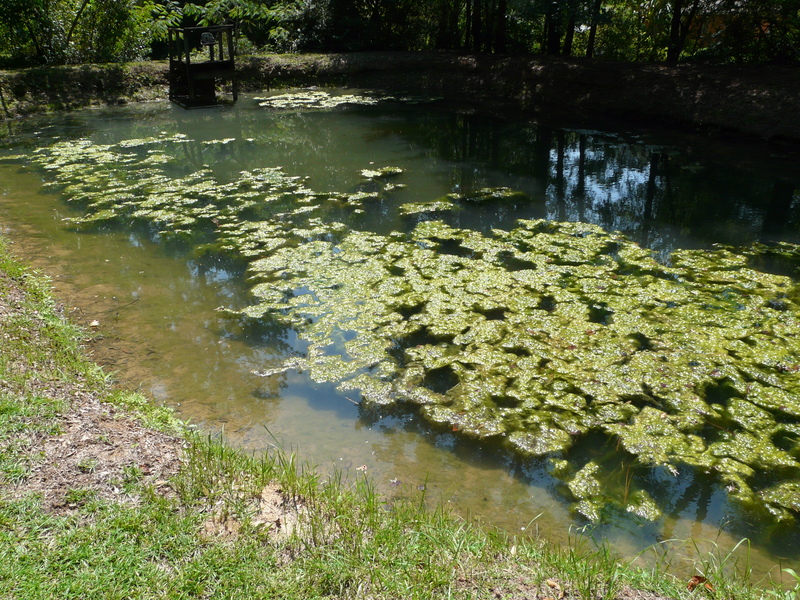 We need to avoid using more than 4 ounces of copper sulfate per acre foot of water in a pond like this – which probably has hardness less than 10 parts per million. I’ve had fewer pond weed calls this year of any. I was talking with Alan Dennard this morning, and he has noticed the same. Last week, I was asked about algae in a pond. Sometimes these small, floating weeds resemble algae from the road. But this is actually duckweed mixed with watermeal. Both of these weeds are commonly seen together. In the morning, they will cover the entire pond. By afternoon, they float around pushed by wind. Oxygen depletion becomes an issue once these weeds take over a pond. There were no fish in this pond, but if this was eliminated all at once, we’d likely see a fish kill. 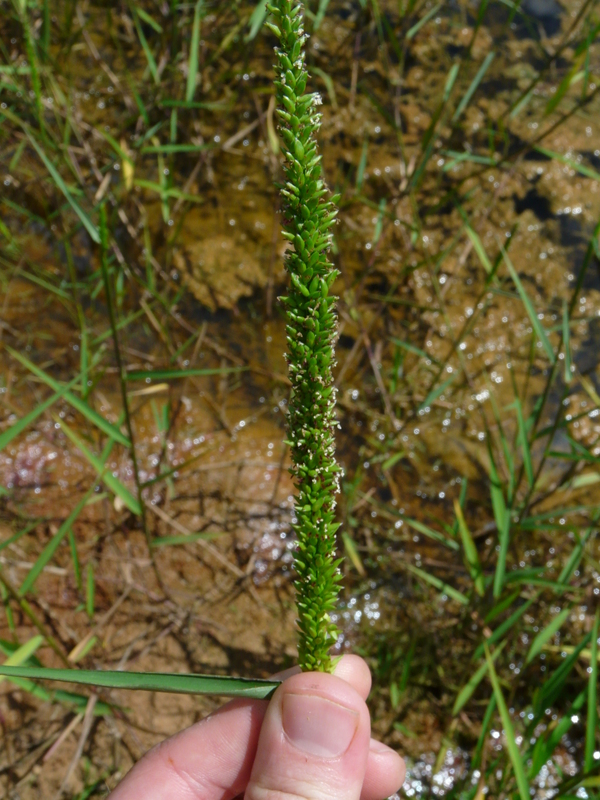 Both of these weeds tend to grow in quiet, undisturbed water. 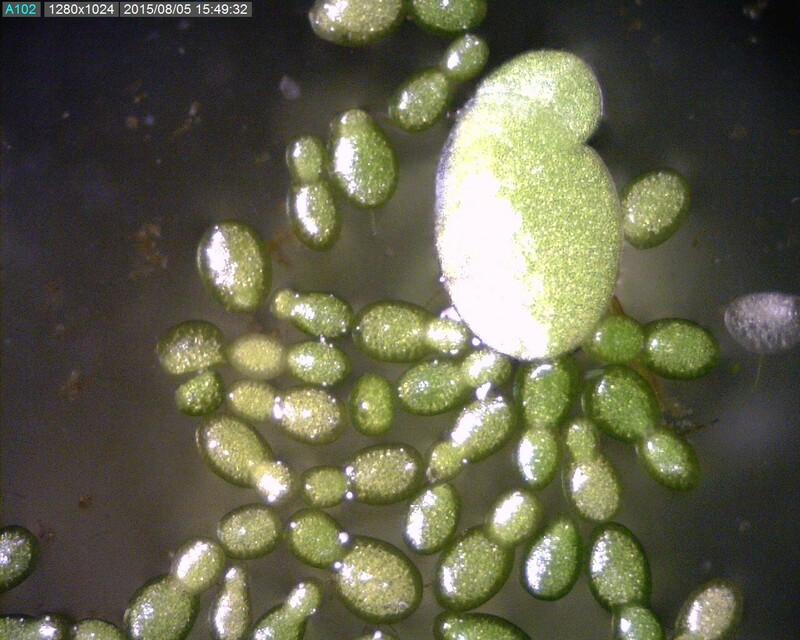 The microscope picture below shows the difference in size between duckweed and watermeal. We would absolutely need to kill only 1/3 of this at a time (if fish are present). Diquat (Reward) has activity on both weeds, as also does Clipper and Sonar.